Bruce Springsteen. Billy Idol. Lil’ Wayne. Van Morrison. A diffuse bouillabaisse of sound and influence as experienced through the lens of Kyle Field’s perennial Little Wings. 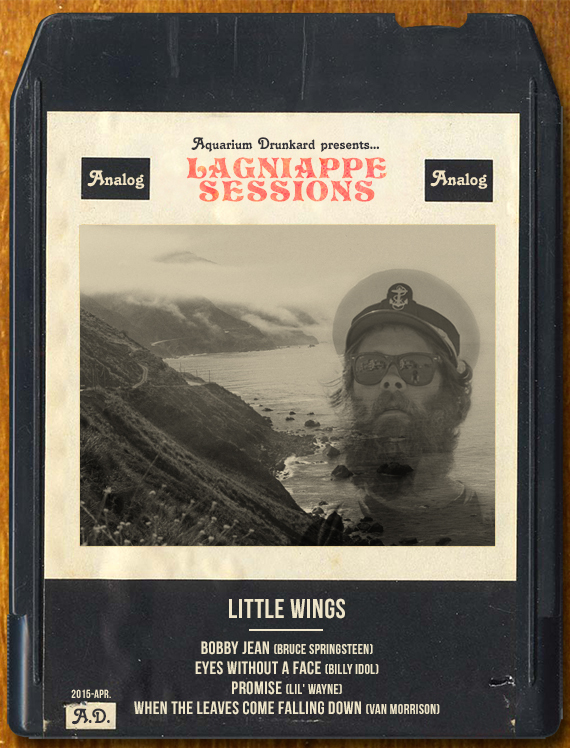 This week’s installment of the Lagniappe Sessions finds us with Field and co. in Topanga Canyon, one month out from Little Wings upcoming full-length, Explains, via Woodsist May 26th. Each one of these songs holds a similar sentimental thread inside for me and they feel linked together for some reason. In some sense I feel like they have similar cathartic tone to each other as well as to the songs from Explains, angling with intimacy and a firm blocking tackle so the moment won’t get away. It is exciting for me to hear these artists’ songs together on a mix tape and I hope someone feels the same. Recorded for Aquarium Drunkard in an original pump house turned studio in Topanga Canyon California by Kyle Mullarky, with Neal Casal. March 2015.